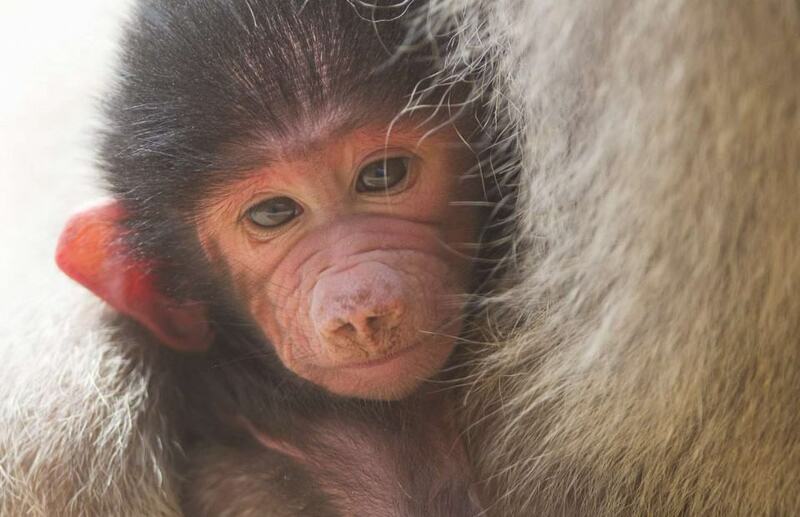 A very special Christmas present has arrived a few days early at Adelaide Zoo with the birth of an infant Hamadryas Baboon. The birth is a great success for the zoo and the species, with the last infant baboon born at Adelaide Zoo more than nine years ago. Born in the early hours of Thursday 18 December to first time parents Chappi and Horus, the new harem (family) is settling in well. Adelaide Zoo Primate Keeper, Sophie Miller says that for first-time parents both mum and dad are doing a stellar job. “Both Chappi and Horus are showing excellent signs of being good parents. From day one, Chappi has brought her little one out to the main habitat, tucked safely under her arm,” Sophie said. “Horrus is very protective of Chappi and his new born, hardly leaving their side. He even sits close by and keeps watch while Chappi and bub take their afternoon snooze. “Since the birth the harem has been spending a lot of time grooming one another, a good sign of social bonding as well as hiding the baby from potential predators. “The little one’s personality is shining through at just six days of age, keeping mum on her toes as it tries to explore nearby surroundings”. The new parents share their habitat with Chappi’s mother, Gina. Hamadryas Baboon are one of five species of baboon found in harsh, dry environments in Africa. The baboons live in multi-level societies in the wild and live with as many as 800 baboons in one area. An adult male dominates his harem with up to 10 females. The new family are on public display, with zoo keepers monitoring them closely. Get within a whisker with our exciting behind the scenes experiences. It’s a great way to meet your favourite animal friends! Think outside the box and thrill your guests with an unforgettable experience at the zoo. Share of lifetime of memorable moments with unlimited visits to Adelaide and Monarto Zoos.